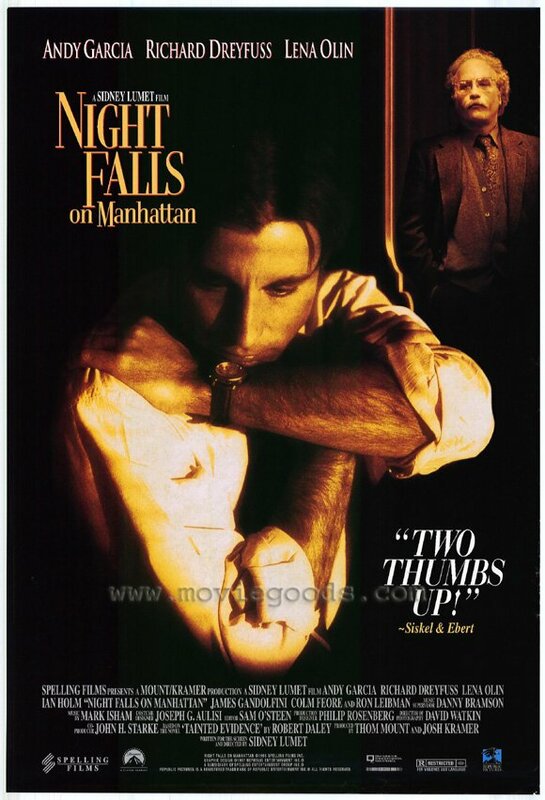 Okay, first let me say that “Night Falls on Manhattan” is not a bad movie; it is just by 1997 we had seen it all before and better. 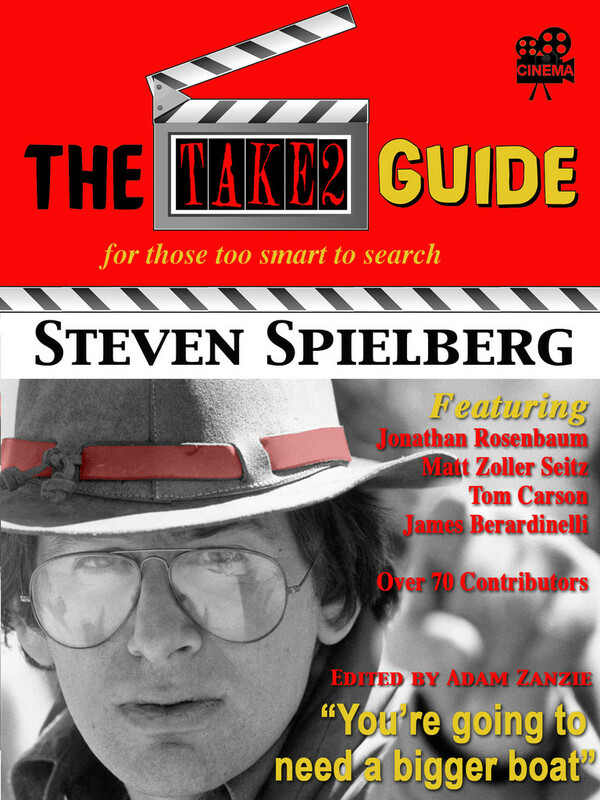 Lumet is on familiar territory here, political fraud, crooked cops, and ethical dilemmas. It is a road he has traveled on many times and at a far better speed. What was once shocking in “Serpico” is now old hat, been there, saw that last night on “Law and Order” or some other TV police show. Life isn’t black and white; there are always shades of gray, that’s the theme running through this political drama. Based on the novel, “Tainted Evidence” by Robert Daley, author of “Prince of the City” and “Year of the Dragon” among others, high values are thwarted, the good guys are not all good, the villains are victims of life, and all are casualties of their owned flawed behavior. Lumet made movies for adults, his characters were not cardboard cutouts, they were real three dimensional people in difficult situations, and never perfect. No matter how hard they tried, they would get caught up life’s complicated twist and turns. Sean Casey (Andy Garcia) has just been hired to be an assistant district attorney in the city of New York; he going through an indoctrination class filled with other eager idealistic dreamers. From here, Lumet swiftly cuts to his police officer father Liam (Ian Holm), and his partner Joey Allegretto (James Gandolfini), who are staking out the biggest drug lord in Harlem. A stoolie informs them what building, and exactly which apartment he’s in. They call for backup. With two pistols in each of their hands they attempt break through the drug lord’s apartment door only to be met with an arsenal of gunfire resulting in Liam being critically wounded. The backup call is answered by a barrage of police cars from three precincts but it quickly turns into a violent debacle with three cops shot dead and the drug lord escaping the hunt, driving away in a police car. What follows is a political nightmare for the current D.A., Morganstern (Rob Leibman), who is running for reelection, as he unexpectedly assigns the case to newcomer Sean instead of his hot shot chief assistant Harrison (Colm Fore). For the defense, the lawyer is Sam Vigoda (Richard Dreyfuss), a William Kunstler style radical who has made a career focusing on notorious and high profile cases. Vigoda gets his drug lord client to surrender to the police but not before having him strip down in front of the press to make sure the reporters witness that the cop killer does not have a mark on his body at the time of surrender. During the trial, Sean proves himself to be an unfaltering prosecutor smartly winning the case. But for Lumet, this just the beginning, where most films would end, he is only halfway finished. Lumet weaves a tale taking us through a trail of human behavior where no one seems to be whom you think or who they even believe themselves to be; the villain may be bad but can the police be trusted to be all good? There’s Peggy Lindstrom (Lena Olin), one of Vigoda’s assistants, who after the trial tells Sean she knew she was watching the start of a great career and couldn’t wait to get to get him into bed. Vigoda himself, a self confessed last of the sixties radicals, admits he was more interested in exposing crooked cops than protecting his scum drug selling client. Joey Allegretto, Sean’s father’s loyal partner of many years swears he’s clean, never dealing in drugs, but is he really? And can Sean even believe his father is not a dirty cop? By the end of the film Sean discovers life is not as simple and straight forward as he believed, good and bad are not so easily defined. Yes, there are rules, laws, but sometimes they need to be bent for justice to prevail. Beside the film’s over familiar themes, there is the improbability of a son prosecuting a criminal case where his police officer father is a victim in the case, the long odds that Casey is such a brilliant attorney, after being an A.D.A. for only eight months and that D.A. 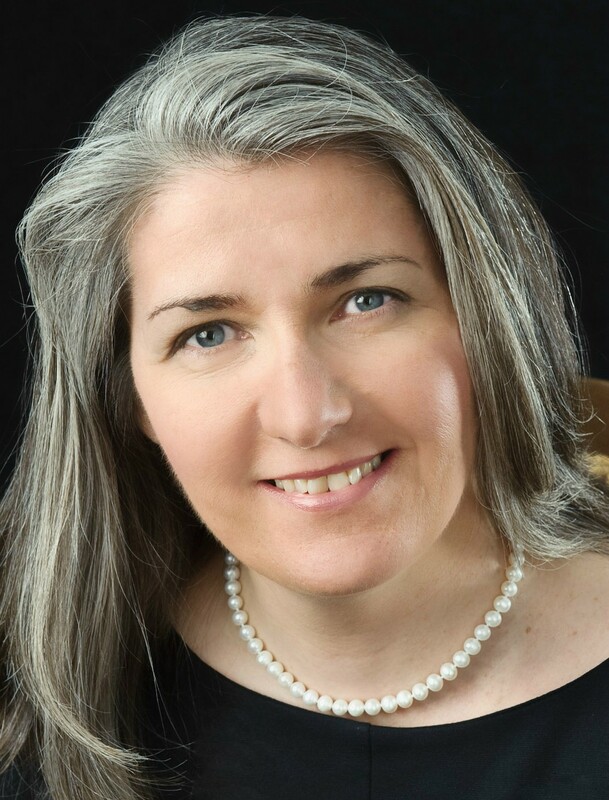 Morganstern, who had to drop out of the Mayoral election race due to a stressful heart attack, along with the Democratic party would push the still wet behind the ears Casey into the spotlight as a replacement candidate is completely implausible. Then there is the love affair between Sean and Peggy which seems strangely lacking in passion. 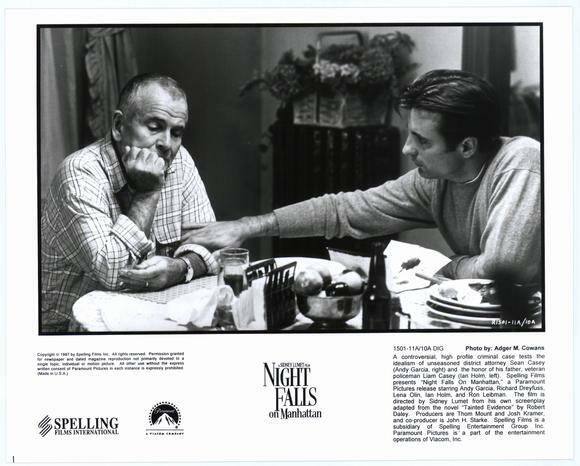 Much sharper defined are some of the smaller roles, especially James Gandolfini’s Joey and Ian Holms as Sean father, both are nicely portrayed, particularly notable in the early stakeout scene between the two partners. Shiek Muhmud-Bey as the violent defiant drug lord is appropriately fierce and nasty. Colm Feore is blatantly smug and stuffy as the Morganstern’s chief assistant. Still, we have seen it all before, corruption, the grimness of the city. The one new ingredient was the recognition of the changing face of multi ethnic America, Garcia’s character, Sean Casey’s deceased mother was Hispanic. In the cemetery scenes you see her name was Maria Nunez. 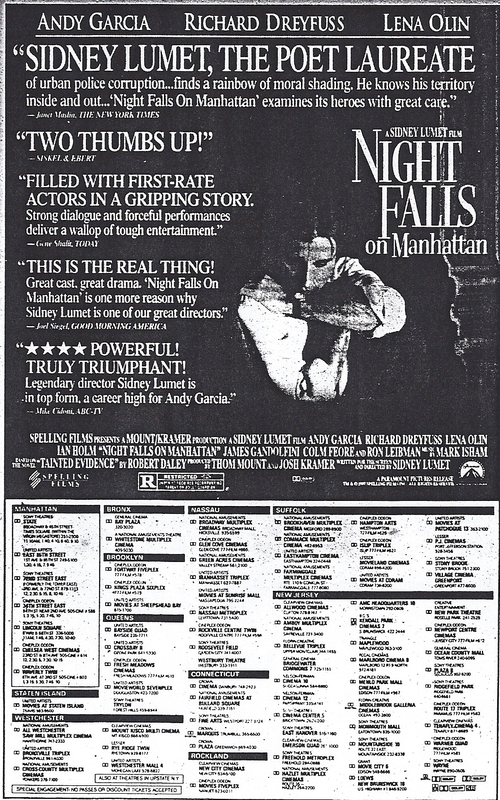 This entry was posted in 1990's, Film Reviews, New York City Films, Sidney Lumet and tagged Andy Garcia, Ian Holm, James Gandolfini, Lena Olin, Night Falls on Manhattan, Ron Leiberman, Sidney Lumet. I like this film. I know, some had problems with the casting of Andy Garcia and they been-there-done-that vibe of the story but it is such a well-made film thanks to Lumet’s skill as a filmmaker that it is still a solid film and one of my faves of his. I actually think that Garcia did a pretty good job and, like so many of Lumet’s New York films, it is great to spot all the NY character actors in various roles. I think Garcia was fine in the role too. I know some had problems with the Irish name but if you live in America today and especially in cities like NY,it happens…in this case Irish father, Hispancic mother. I did enjoy the film, great NY scenes, nice feel to it. My problem was with the script that had what I thought were some improbable situations.I thought the scenes with Gandolfini were terrific. This is not one of my favorite Lumets John, though you basically admit as much in your opening sentences. This was basically an encore of what was done much better before by the director and by others working in the cop genre. The acting though, was quite good. Excellent essay here! Um dos melhores filmes jurídicos que existem.